All parents consider their children's well­being a top priority, and it is often the foremost thought on parents' minds as they separate. Parents who are sensitive to children's needs and can set aside their differences and collaborate on behalf of their children are more likely to have children who thrive despite parental separation. Children may experience a range of mixed feelings initially to their parent's separation, including shock, sadness, anger, or even relief if they notice reduced tensions between their parents. This is understandably difficult, as parents are under enormous stress themselves. According to the American Academy of Pediatrics clinical report, Helping Children and Families Deal with Divorce and Separation, many children experience short-term, painful feelings and bounce back within 2 to 3 years after the separation. Divorce can be associated with longer-term academic, behavioral, social, and emotional problems. 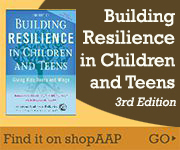 How children react depends on their age and development but also on their parent's ability to remain sensitive to their needs, despite what is certainly a great deal of stress and transition in the parents' own lives. An optimistic versus catastrophic thinking style can be a determining factor in how a child copes with the divorce. Parents can have a great deal of influence in helping children realistically assess situations and avoid catastrophic thinking patterns that assume the worst of situations. Children prove to be more resilient and less stressed when there is less conflict between their parents and when the divorce removes them from high conflict households. Therefore, it is critical that you shield your child from fighting as much as possible. Children do better if both parents continue to be positively involved in their lives (assuming both parents are safe, capable caregivers) and, in particular, if the nonresident parent maintains a close and supportive relationship with the child. Both parents should continue to listen to their children about their problems, provide emotional support, help with everyday issues like homework, and maintain rules and expectations for behavior. Children who experience parenting that promotes warmth and boundaries thrive. A stable and consistent approach to parenting during divorce is particularly protective for children. Children do better when their parents collaborate, communicate regularly, and offer consistent rules across homes. In particular, consistent parental discipline has been shown to be important because it ensures clear boundaries that don't vary widely between homes. It is critical that parents support, rather than undermine, the other's parenting authority. During times of change, even turmoil, it is important that children maintain as many routines as possible. Finally, children who are better able to seek out and obtain support from others are better able to adapt to the changes associated with divorce. Encourage your children to talk to you or a trusted friend or adult about what they are going through; show them how you reach out to others for support. Demonstrate that you genuinely believe reaching out to others is an act of strength. Parents often experience guilt around divorce because their relationship has failed and they worry about the effect on their children. Hostility in the home it is good for parents or kids. If parents will be happier living separately, they will likely be better able to provide positive support their family. If parents will be much happier living separately, they will have more time for themselves and their children.